Angel Number 84 indicates that the divine fairies are sending you a communication that you have the divine qualities and you have to put them to use while you are acting on your goals. You have the assurance from the ministering angels that you have their assistance and guidance in all the things you are planning to accomplish in this life. You have to use your intellect and exert yourself to your full potential to attain your divine objectives. 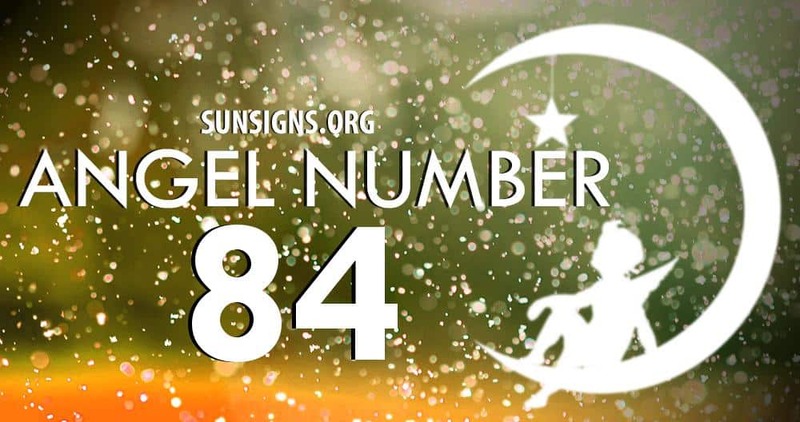 Recurrence of Angel Number 84 symbol in your life often is a message from the guardians that your devotion and sincere efforts to realize your targets in life have been noticed and appreciated. Angel number 84 says that you are reaping the bounty presently for your previous hard work and persistence while working on your goals. You are being persuaded by the angels to carry on with your efforts so that you will be able to realize your intended ambitions in life. Your meticulous actions will result in enhancement of your life in all aspects. Angel number 84 symbolism has a mix of the characteristic and forces of Number 8 and Number 4. Number 8 relates to the qualities of materialization of plenty of wealth and opulence, Spiritual rules of action and reaction or Karma, perception and mental power, benevolence and acceptance. Endurance, realism, service, self-assurance and accomplishment are the additional attributes. Number 4 has the traits of diligence and forming a strong base, persistence and strength of mind, purpose and action, reliability and accountability. It also stands for talents and firmness, enthusiasm and forcefulness, commitment and common sense, sincerity and truthfulness. Angel Number 84 meaning signifies the closure of a major sequence of events in your life. You are being promised by the angels that these transformations in life are essential. They will bring with them favorable prospects based on the present needs which are aligned to the divine intentions and objectives of real existence. They will boost your profession and financial rewards. Angel Number 84 recurring numerology symbolism denotes that the time is propitious for engaging yourself in a spiritual vocation or for guiding others to improve their spirituality. You can always count on the encouragement and direction from the angels to overcome any challenges you may face in this profession.